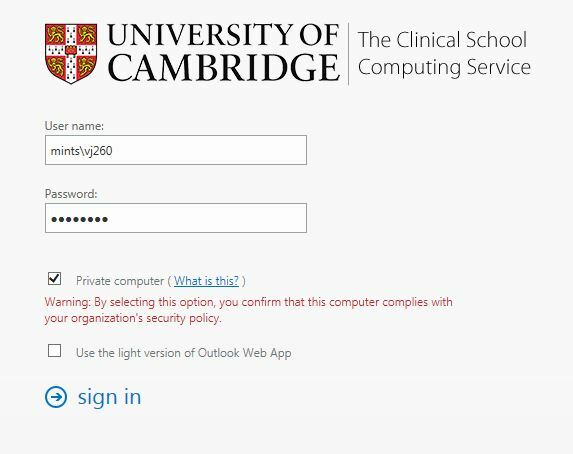 The Clinical School Computing Services operate an email service based around Microsoft Exchange Server. Details of this service are listed below. All mailboxes are linked to a CSCS User Account. If you have one, then you will also have an @medschl.cam.ac.uk email address. The mail servers do operate as a standard IMAP and SMTP mail server but the preferred connection type is to use an Exchange MAPI connection. You can apply for a CSCS User Account which comes with email or if you already have an email account with us then you can apply for a Mailbox Only Account which can be shared between multiple users (to send and receive from). We also have guides on configuring your personal devices to access our service available here: https://confluence.medschl.cam.ac.uk/x/wou4. These guides cover the use of Webmail, iOS and Android, MacOS and Windows.